Zinc sulphate heptahydrate, a fully soluble fertiliser containing zinc and sulphur recommended for preventing or correcting zinc deficiencies in vegetables, fruits, flowers, turf, vines and ornamentals grown in soil and soilless culture. 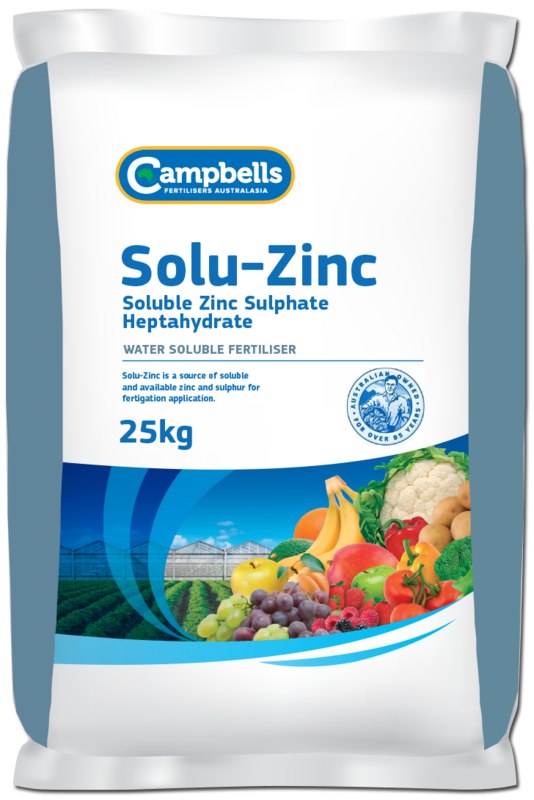 Campbells Solu-Zinc is a fully water soluble, chloride free fertiliser containing zinc and sulphur nutrition for consistent growth responses on a range of plants. Zinc is involved in early leaf emergence, cell division, auxin production, flowering, pollination and fruit set. Good levels are associated with high yielding, good quality fruit and vegetable crops. Campbells Solu-Zinc is suitable where zinc and sulphur requirement is high and supply is lacking. Solu-Zinc is for application via irrigation systems (fertigation) in soil grown and hydroponic crops as well as foliar application. It dissolves rapidly and completely and remains in solution ready for root adsorption. General fertigation rates for horticultural crops are between 5-25 kg/ha through the fertigation system. When applying Solu-Zinc through the irrigation system more frequently and smaller applications guarantee the nutrients are supplied to the plants without being lost due to leaching or excessive rainfall. The actual rates, number of applications and timings for specific crops will vary considerably between crops and districts. As with any fertiliser program, it is best to seek advice from your Campbells Solu-Zinc distributor or your local agronomist.